Fifth-grader Ryan “Mighty Mouse” Dugan (53) blocks for Cole Pontine, allowing Pontine to run in for a Demon touchdown on Saturday against the Farmington Spartans. Pontine ran for 147 yards and two touchdowns in a 37-6 victory. It was another successful week for Durango’s Young America Football League, as all four of the teams in action came away with victories. Durango’s third-grade team notched its fourth shutout in a row last week with a 41-0 drumming of La Plata County counterpart Bayfield. In the game before the Bayfield matchup, the Demons blanked Kirtland 13-0. The defensive line of Hunter Wildman, Jayden Dosch, Carter Koch and Aden Urias dominated both games to help the Demons to the shutouts. The Wolverines had no answer for Durango’s Grady Feeney and Blaze Aguilar. Feeney threw for 84 yards and three touchdowns, two of which went to Aguilar on 40- and 25-yard passes. Aguilar also broke a 25-yard TD run. Tyler Dugan broke the biggest play of the game, taking a tight end reverse 60 yards for a score. Tyler Hoerl and Jakob Maycock added touchdowns in the win. The dominant defense of the Demons will be tested this week with a game against the undefeated Bloomfield Bobcats at Miller Middle School. The second-grade Demons had a bye this week, but two weeks ago, the shorthanded team battled the Farmington Crush to a 13-13 tie. The Demons were limited to just 13 players against the full-strength Crush. Oliver Nez, Kegan Cowan and Darion Allen made big plays on defense to keep Farmington’s offense contained. On offense, Jerad Lopez scored all 13 points for the Demons. He had two touchdowns behind key blocks from Patrick Tucson and Ethan Aggeler and converted an extra point. 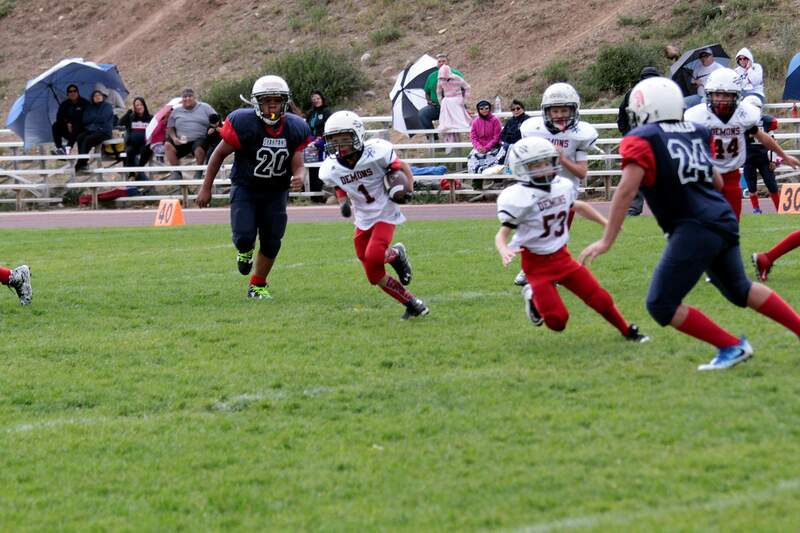 After a 26-0 loss to Aztec two weeks ago, the Durango’s fourth-graders blanked the Farmington Vikings 12-0 this week. Nathan Beal led the Demons with 58 total yards and one touchdown. Brady Hoerl scored the other TD. Steven Gallegos led the defense with six total tackles and two fumble recoveries. Cooper Mitchell matched Gallegos with six tackles. The Demons will next play Montezuma at 1 p.m. Saturday in Durango. Coming off a bye last week, Durango’s fifth-grade team rolled to a dominant win behind the strong play of its offensive line. Linemen Connor Jones, Elijah McGrady, Elijah Oyler, Braxton Waddell, Lucius Lucero and Marcus Cullum led the way for the offense, which cruised to a 37-6 victory against the Farmington Spartans. Cole Pontine benefited from the line’s success and ran for 147 yards and two touchdowns. Defensively, the Demons swarmed to the ball and gang-tackled the Spartans’ bigger runners. Durango will host Montezuma at 3 p.m. Saturday at Miller Middle School. The sixth-grade team shut out the Farmington Sting last week in a 37-0 rout and followed it up with a 14-7 win against the Farmington Force. Tyler Harms and Jacob Roberts provided the two touchdowns for the Demons. Ian Szura led the team with 10 total tackles, five of which were solo tackles. Ethan Bustamante, Julian Rodriquez and Luke Meier had strong games on the defensive side of the ball to help hold the Force to one score. The Demons will take on Cortez at 9 a.m. Saturday at Miller Middle School.